WATKINS GLEN, N.Y. _ In addition to his title as reigning NASCAR Cup Series champion, Martin Truex Jr. proudly has emerged as a bona fide road-racing ace. Truex captured his first win at Watkins Glen International last summer, and followed it with a victory at Sonoma Raceway in Northern California earlier this season. Based upon that momentum, the idea of winning three consecutive Monster Energy NASCAR Cup Series road-races suddenly remains truly do-able heading into Sunday’s 33rd annual Go Bowling at The Glen. Truex since has figured out how to turn right-and-left at speed. Truex has led the most laps in the last three Cup road races _ 2017 at Sonoma (25) and Watkins Glen (24) and 2018 at Sonoma (62). In 12 career-series starts at The Glen, Truex has logged that one win and four top-five results, finishing outside the top-25 only twice. With a win this weekend, Truex would become the first driver since Kyle Busch (2008) to win at both Sonoma and Watkins Glen during the same season. Truex also would become the first driver since three-time Cup champion Tony Stewart to win three consecutive Cup road-course events. In garage area vernacular, that would elevate Truex’s title to “road-course ringer” on the level of the retired “Smoke” and Mark Martin and Jeff Gordon and current rivals Kyle Busch and AJ Allmendinger. “It means a lot to me, personally,” said Truex, driver of the No. 78 5-hour ENERGY/Bass Pro Shops Toyota Camry fielded by Furniture Row Racing. “I think everyone in the garage_ you want to be known in the garage as a driver that can win anywhere. Certainly road-courses are a unique set of circumstances. I think it’s an extra special feeling to be able to win at tracks that are completely different like this. I feel like we should have three in a row already and be going for four. History shows that a repeat win at The Glen is a massive chore, as no current driver has accomplished the feat. Former Cup favorite Marcos Ambrose, who since has returned to race in his native Australia, remains the last to win back-to-back races at the Finger Lakes facility (2011-12). “I’m looking forward to it,” Truex said in the track’s media center after Saturday’s opening practice. “We’ll see if we can make it three in a row. Being able to put it all together last year here and win was a big win for my career. We’ve been coming here a long time, so to finally get that win was special. A four-time winner this season, Truex is third in the championship standings, 129 points behind leader and six-time race-winner Busch of Joe Gibbs Racing. Point runnerup Kevin Harvick of Stewart-Haas Racing _another six-time race-winner _ is 48 points behind Busch. 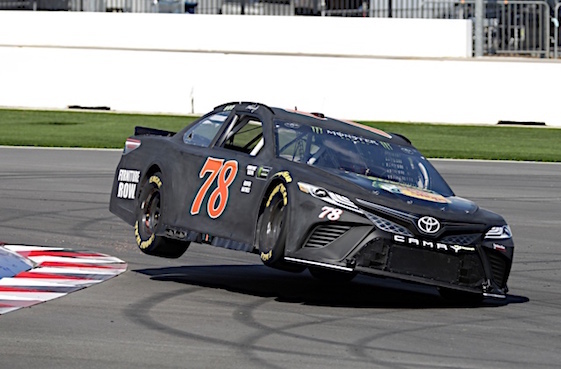 Although Truex finished a subpar 15th at Pocono Raceway last Sunday, he has nine top-five results in the last 11 races including three wins. Since his Pocono win earlier this summer (eight races ago) he has led 370 laps, or 57 percent of the laps he’s paced on the year. Busch won his sixth Cup race at Pocono with Harvick managing a top-five after an inspired run up through the field. Add Truex to the so-called “Big Three” that has re-defined contender/pretender. Truex allowed that the nuances that separate himself from Busch and Harvick typically depend upon the track-of-the-week. “I can’t speak for those guys, but I’m sure they have certain tracks they feel they’re better at or team is better at or they really have dialed-in and have that confidence,” Truex said. “I think we all have tracks where maybe we feel like we have a slight advantage. And you hope that when you get to those places, you can take advantage of it because it’s important as those other guys are so good everywhere. Busch has four road-course wins _ two at Sonoma and two at Watkins Glen _ and also won the NASCAR Xfinity Series race at The Glen last summer. On two other occasions Busch has led the most laps in the Cup race (in 2011 and 2012) and finished third and seventh, respectively. He has 11 top-10 finishes at Watkins Glen in 13 races making him the highest-rated driver here with more than one start. Busch’s victory Sunday gave him eight top-five finishes in the last nine races in his No. 18 M&M’s Crunchy Mint Toyota, including three wins (Charlotte, Chicagoland and Pocono). During that time the 2015 Cup champion has led 538 laps and at least one lap in eight of the last 10 races. Busch is anticipating a similar performance Sunday on a track he insisted he enjoys…notwithstanding the occasional run-in with Brad Keselowski. “I think what makes this road-course unique is just how fast it is. It’s a very fast road-course,” said Busch, 19th in the final practice at 122.706 mph. “There’s a lot of speed here. There’s a lot of technical areas. There’s a lot of time to be gained through those technical areas, but also with the amount of speed that you carry here, any dip in that speed is a big-time loss. There’s a lot of that that’ll happen around this racetrack. It’s a fun place though. Harvick still is scrambling to find his Watkins Glen groove. He won the Cup race here in 2006 and the Xfinity Series race in 2007. But the 2014 Cup champ has only two top-10 finishes in the last six starts at WGI. In total, he has eight top-10 finishes in 17 starts at The Glen. Harvick, however, is racking up career numbers in 2018. The driver of the No. 4 Busch Beer Ford Fusion has seven top-five finishes in the last eight races, including a win at New Hampshire Motor Speedway two weeks ago and a pair of runner-up finishes at Michigan and the series’ first road-course in Sonoma. Harvick stood 13th on the speed chart after the final practice at 123.267 mph in a session topped by Chase Elliott at 124.520 mph in the No. 9 SunEnergy 1 Chevrolet Camaro. While NASCAR’s Cup and Xfinity series do not run the entire 3.45-mile sports car “long course” layout here, Truex agreed with Busch that Watkins Glen easily is the series fastest road-course. “We go to Sonoma and you think that…I feel like Sonoma is like a short track, right?” Truex said. “A lot slower corners, a lot…I would say I guess more technical maybe, but more turns, a lot slower speeds, less heavy braking zones, less grip, a lot more tire fall-off. Just completely a 180 from there to here, where here you have really high-speed straights and even high-speed corners. A few heavy braking areas but not much tire wear, not much fall-off, fresher pavement. “Just the feel you get here is completely different than Sonoma. I guess for me here, just the speed. This is a speedway of road-courses in my opinion just because of the speed you carry around here and it’s…it can be quite treacherous, especially since the repave with fairly hard tires on these cars and a lot of horsepower. It’s quite a handful and it’s pretty exciting. Qualifying, scheduled for 6:35 p.m. (EDT), will be televised on NBC Sports Network. NBC’s live race telecast will begin Sunday at 2:30 p.m. with coverage also available on MRN and SiriusXM NASCAR Radio.